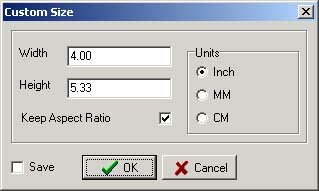 The custom size dialog is used to set an image to a custom size (funnily enough). Select 'Custom Size from the 'Fit To Size' submenu (on the 'Items' menu). Right click on an image in the preview pane and select 'Custom Size' from the 'Fit To Size' submenu. If the 'Keep Aspect' ratio box is checked, then altering the width will also alter the height (and vice versa) to keep the same aspect ratio. To save a size for later reuse, check the Save box and click on OK. Saved custom sizes will appear in the 'Fit To Size' menus. They can be deleted or renamed on the User Defined option page.